In the spring of 2006, Legacy Hill Farms purchased and imported Weltino's Magic as a personal horse for owner, Michelle Lauber. Magic lived and trained at Legacy Hill Farms for over 18 months. When Magic grew to 18 hands he was sent to Steffen and Shannon Peters for training and competition. Not long after arriving in California, it became apparent he was destined for the big arena with Steffen and the rest is history. Magic became a beloved representative of the United States in many international competitions. 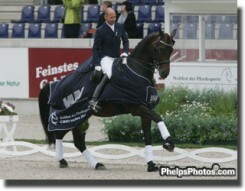 Steffen and Magic's list of accomplishments include double gold medals at the 2011 Pan American Games after sweeping the small tour at the World Equestrian Festival in Aachen. "Magic" was known at LHF as an incredibly handsome, intelligent, talented young man who took your breath away with his enormous presence and movement. He is still missed but we are so proud to have known this incredible horse. Tragically we learned that in November 2016 Magic died due to complications after colic surgery. This incredible horse will be missed and always loved here at Legacy Hill Farms. Legacy Hill Farms and its owners are also so proud of this incredible team, Lombardo LHF and Brian Hafner. Lombardo was hand-picked years ago imported to LHF for further training. He was a very special horse with his endearing personality, workman-like attitude and amazing intelligence. He always learned everything so quickly. When Brian came to try horses, just then only a teen of about 16, it was immediately apparent these two were going to be a super fit. Brian has done an incredible job with Lombardo LHF. We are very proud to have chosen and imported this wonderful, talented gem to represent us. Lombardo LHF and Brian won the Brentina Cup in 2012 and were unbeatable at the Festival of Champions in Gladstone, NJ. ​Thank you, Brian, for giving Lombardo LHF such a wonderful home and career! Congratulations! Below are just some of the fantastic horses we have imported over the past two decades. We apologize for the quality of some of the photos. When we began importing, digital photography was not what it is today.